This article is aimed at University clubs who want to recruit and develop players from a very large, very inexperienced group of freshers turning up to taster sessions at the start of the year. This is a guide for how the returning players can teach basic catching and throwing techniques, and how to behave in the games to ensure everyone has a good time and wants to return. When experienced players are able to teach basic techniques to incoming players, the speed at which freshers improve increases dramatically, and when experienced players know how to play in a fresher-friendly way during the first weeks of term, the retention of players skyrockets. The first step to getting this working within your club is to connect with the returning players before term starts, and make sure everyone is on the same page when it comes to interacting with the freshers. When a fresher arrives at their first training or taster session, they should be welcomed by an experienced player, and invited to throw a Frisbee around for 15-20 minutes – in pairs or in as small a group as possible, with one experienced player per group. After a few throws, the experienced player should ask if the fresher would like some tips on their catching or throwing. It’s important to ask this question and get a ‘yes’ answer, as then the fresher has psychologically ‘bought in’ and will be eager to listen to what you have to say. Make sure the first thing you do is pay them a compliment. The order of these four points is critical. Don’t teach the fresher about grip until they have their footwork sorted, don’t teach them about the release until they have their grip sorted, and so on. Focus on one point at a time, give them a compliment every time you give them a tip, and try to relate the usefulness of the movements to the game. Remember at all times that you are setting an example with your own throwing and catching, and a lot of players learn by watching rather than listening, so be a model player with clap catches at your chest and wide, low pivots – “classic” technique. After these 15-20mins of throwing in small groups, it’s time to play. Remember that when a fresher comes to Ultimate practice for the first time, they don’t want to learn how to play great Ultimate; they just want to play. They certainly don’t want to be told to stand in a line and run in a particular direction for no apparent reason, so skip any drills and go straight into games. Split the players into groups of 4-6 beginners with 2 experienced players, to play 4v4 / 5v5 games (not 6v6+). Whilst the pitches are being set up, the 2 experienced players per team should briefly explain the basic rules and have a chat for a few minutes to get to know their team. Make the pitches big enough for a good run around – 20 meters wide by 40 meters long with 3 meter deep end zones is reasonable. If the beginners can be split into groups with some pre-existing connections (friends, living in same accommodation, course mates etc. ), this is even better and will really help retention. 5) It’s self-refereed, so call your own infractions and decide between players what happened and how the game should continue. It can be good to talk more about Spirit of the Game / self-refereeing before the games start, and during the game make sure that everyone stops for any clear fouls & that the related rules are explained to the players, who should come to their own agreement about what happened. Freshers won’t often stop the game – you have that responsibility. – Let freshers pick up the disc if they want to. Progress to calling a couple of people at the start of the point who will pick up the disc and make sure you rotate through everyone. – Throw slow, flat, easy to catch passes, both for short and long throws, even if they are easier to intercept. – Throw when the cutter wants it, even if you know it’ll be intercepted. In the worst case, the defender does a good thing, and your team mate feels you trust them. – Let your team know you’re always there for the easy pass if they need it, but don’t demand the disc, don’t reprimand speculative shots, and try to always be a hittable option for the thrower. – Don’t teach a formation (such as stack) unless the freshers ask about strategy – it’s too much information at this point. Better to work from principles around creating and using space. Under no circumstances stand over the disc waiting for everyone to ‘stack up’, or pick up the disc and demand ‘cuts’. The game might seem like chaos, but this doesn’t mean the freshers aren’t enjoying themselves more than they would if it were disciplined. – Put up long shots, especially if it’s getting crowded around the disc. This will encourage deep cuts and throws in future points, and will also give freshers the unique experience of chasing down a long throw… an experience which in itself can be enough to get a fresher hooked. – Ensure everyone is getting disc time by being mindful of who you’re looking to pass to. Calling a ‘string’ play helps with this (player A looks to player B, who looks to player C, etc.). – Don’t teach the stall count (or stall anybody) for the first week, it only adds pressure and complicates things. Forces should be loose. – If marking another experienced player, let them get free when and where they want around the disc. After summer it’s tempting to play hard against your peers, but you must resist. If the experienced player you’re marking goes for the end zone though, go for an amazing interception. – If marking a beginner, let them get free too, though mark them out when they start clogging space around the disc as it’ll encourage them to clear out. If the genders on the pitch aren’t balanced, it can be better for an experienced player to mark a female fresher instead of another experienced player. – No poaching. It’s not a challenge to get a poach D in a game with beginners – especially when you’re already out of position due to letting players get the disc as detailed above – and it’s not fun for anyone else. – No point blocks or even stopping break throws – you want throws to either be completed or be intercepted by beginners. If an experienced player wants to break you, let them. If a beginner looks like they’re going to throw it into your force, get out of the way. Don’t let your team know you’re not pulling in the same direction as them on defence – make it look like you’re concentrating and playing hard – but be ineffective. – Don’t teach strategy, such as forcing one way, unless the freshers ask, or if you’re nearing the end of the session and your team has a good understanding. Better to work from principles and simple instructions – man defence can simply be explained by saying, “if they throw the disc to your man, catch it before he does”. – When marking confident or athletic beginners, raise the intensity to give them a proper challenge. Some freshers won’t come back if you intercept their throws or mark them out, while other freshers won’t come back unless they get a tough challenge and are shown what they can achieve, so play it by ear. – When two experienced players are involved in a foul and have a subsequent discussion, remember you are setting an example for all the other freshers, so explain your point of view honestly, clearly and respectfully, and settle the call in the ‘proper’ fashion – a joke between friends may be misunderstood by freshers. – For violations such as travels, picks, and close in/out calls, and not quite being in the end zone for a score, only stop the game if it’s a fresher who notices the violation – even if it affects the play, it’s much better for the game to continue if the freshers don’t notice. Finally, remember it is your responsibility as an experienced player to ensure everyone on the pitch is having a good time, and not just your team. You could be scoring every time and thus feel everything is going great, but think about your opposition, and adjust your tactics accordingly (having your weaker freshers pick up the disc, for example, or attempt an exciting deep throw against their best defender). After the games it’s good to circle up and let the freshers know how your club works – for example, everyone is welcome to continue coming along even if they didn’t have a good practice that day, and that over the year they’ll all be taught everything they need to know to go from a noob to a good player. Mention beginner tournaments, fun tournaments, the BUCS league and Nationals, so you’ll retain the competitive freshers who will be trying to get onto your 1st / 2nd team from the start, as well as those who simply enjoy the game and will make your club socials great. It can be good to have a big game (like a showgame) after everyone finished, so let everyone know that some people are going straight to the pub (on campus near where you train, hopefully), and some are sticking around to play a quick game of 7 vs. 7 first, where freshers are welcome to join in. This game should be on a full size pitch, with as close to a 4:3 gender split as possible, and everyone playing proper, hard Ultimate, hopefully showing what the freshers can aim for. Again, don’t call picks or travels, but do call and discuss fouls properly when they occur. 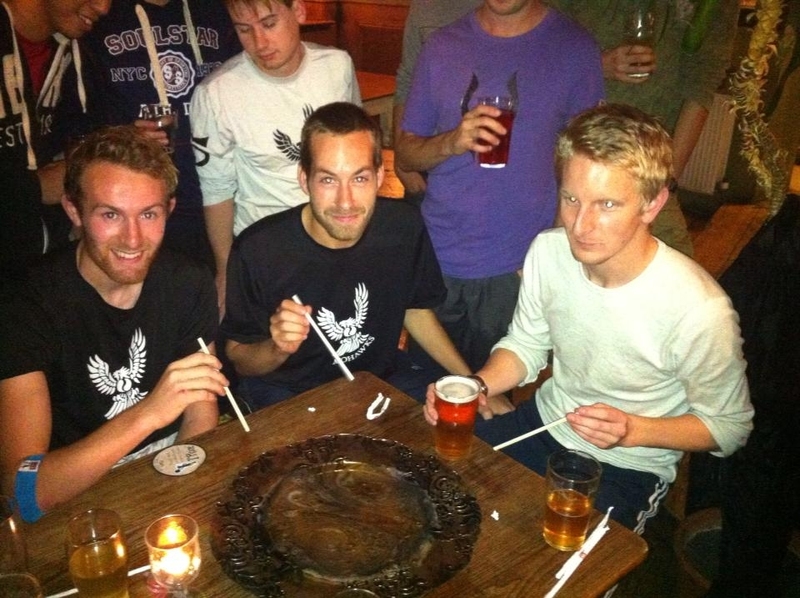 After a couple of points invite freshers to get on the line and join in – there will always be a few that are keen. Make sure the experienced players try to persuade their team mates from the 5-aside games to get on the pitch, and to sub out for any freshers that show interest in playing. You may only get a handful of freshers joining in, but they will likely love the experience of being on a big pitch with so many experienced players, and they’ll appreciate greatly how they have been given the opportunity to play in a fairly high level game at their first session. After the session, make sure as many freshers as possible come to the pub, and then talk to them! It’s very tempting to catch up with your team mates who you haven’t seen all summer, but there are better times for that, so be mindful of who you’re chatting with. Go out of your way and make it your responsibility to get every fresher talking, as it can easily make the difference between them never coming back, and them captaining the team in two years time. 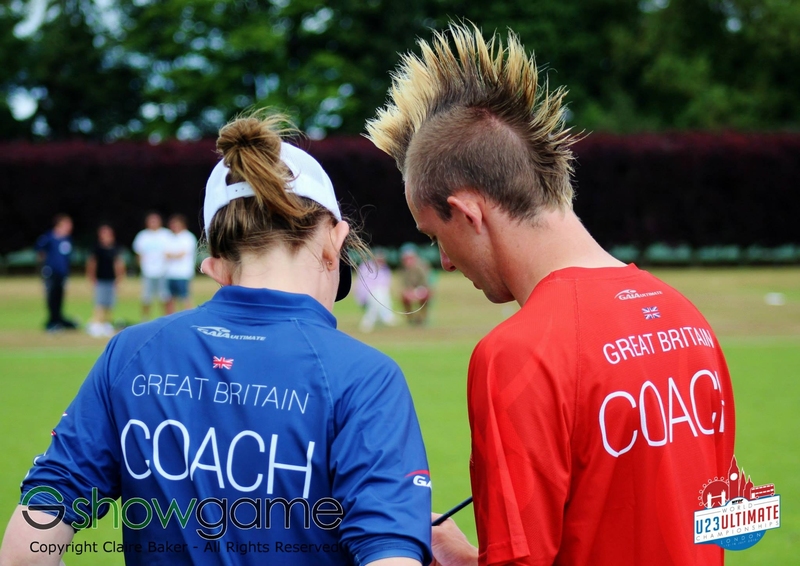 The confident and athletic freshers will want to hear about the GB Junior and GB U23 opportunities available to them if they stick with Ultimate – they want to be challenged and they want to know it’s possible for them to achieve greatness. There will also be freshers who want to take up a sport but hate the ethos of rugby and football so now is a great time for them to find out if the vibe of your club is something they can enjoy. 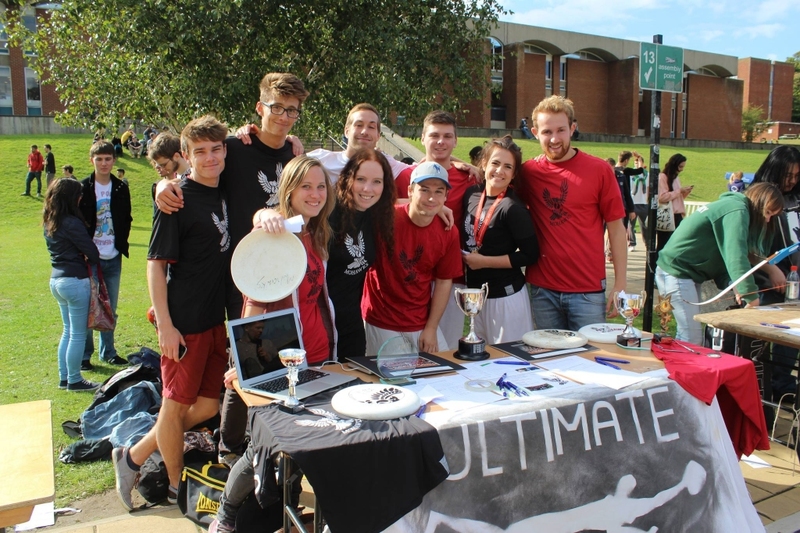 By applying the advice given here at your taster sessions, your freshers will hopefully enjoy their first experiences of Ultimate and become hooked in no time. By ensuring all experienced players learn these guidelines before the fresher intake each year, hopefully the recruitment and retention rates for your club will keep growing, and thus lead to huge performance gains.